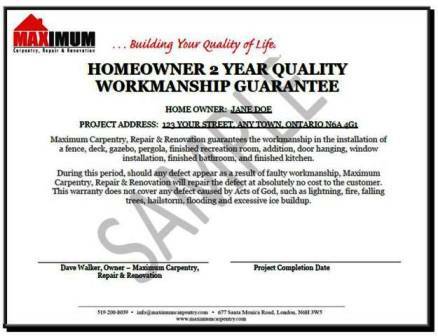 We stand behind our work, our clients are given our two year workmanship guarantee to ensure complete satisfaction. Our commitment to quality workmanship, over 25 of experience in the construction industry and exceptional customer service ensure client satisfaction. Thank you so much for all your help with our deck. We are certainly very happy with how much better it feels and looks. ... If we hear of anyone else needing your services we will not hesitate to recommend you. I am enjoying the fence and deck it looks very good. My older sister was by Sunday afternoon and really liked it. Thanks again. on my new bathroom. We love it! the work is exactly what we had hoped for. We are hoping to do our kitchen next year; we'll be calling you! work and the excellent job you did in my emergency situation. I won't forget it and you have my referral. We enjoy the deck - we do love it. (We) are sitting here and talking about how great it was having Dave and Wes here. And how wonderful their spirit is. Will miss them. Of course you are very welcome to come by and take photos. It would be a great pleasure to meet you. In every way, Maximum Carpentry did great work replacing my rotting old deck with a shiny new one. They were prompt, speedy (did a big job in just a couple of days), went beyond my hopes and visions when it came to creativity and sturdiness of design, and - this is not unimportant - were very pleasant to have around, too.